2. The admissions in THREE APRJUNIOR COLLEGES for MINORITY BOYS (GUNTUR,KURNOOL)AND GIRLS(VAYALPADU) WILL BE BASED ON SSC GPA MARCH 2018 for Minority Boys & Girls, and a separate notification will be issued. However, these colleges are shown here to know information about their location, groups offered, number of seats allotted and the jurisdiction. SC, ST, Seats in these colleges will be filled with through APRJC- CET-2018. The candidates have to mark their answers in the OMR sheets. The question papers of APRJC CET will be based on 10th standard in AP state syllabus for subjects and English will be General English . ii. The candidate after satisfying himself/herself about the eligibility criteria for the submission of application through online shall pay a fee of Rs.150.00 through online from 15.03.2018 to 10.04.2018 for submission of application through Online . iv. 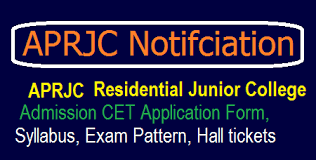 On payment of fee at ONLINE, the candidate shall be issued a Journal Number’ with which she/he can proceed with submission of application through online through the website http://aprjdc.apcfss.in Issue of Journal Number does not mean that the candidate has completed submission of application online. It is only a confirmation of the fee received. • Candidates can download their Hall Tickets from the website at http://aprjdc.apcfss.in or www.apresidential.gov.in from 01.05.2018 to 09.05.2018 with the reference number allotted to them. • Candidates have to download the hall tickets from the website only. No printed hall ticket shall be issued/posted to the candidate. • Request for issue of duplicate Hall Ticket will not be entertained. • Without hall ticket, no candidate will be allowed to appear for the examination. 15. ADMISSION: - Admission will be made through counseling. First counseling for admission will be placed after 01.06.2018.